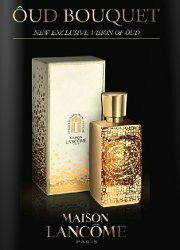 Lancôme has launched Oud Bouquet, a new limited distribution fragrance. Oud Bouquet is a follow up to last year's L’Autre Oud. Oud Bouquet features notes of saffron, rose, oud, vanilla and praline. Lancôme Oud Bouquet is available in 75 ml Eau de Parfum, £120. It is currently available at Harrods in the UK (but not as of yet online). Update: Harrods Magazine called this fragrance "Oud Bouquet", but it is now online there as "L’Autre Oud En Rose". The box does not have a fragrance name so I'm not sure what the official name is. Saffron, rose and oud! Well, that certainly is novel. Haven’t seen that one before. Yah! But I never smelled L’Autre Oud, no idea if they’re doing a stupendous job with these. At least the bottles are pretty. What’s with the praline accord? Is praline the new pink pepper?